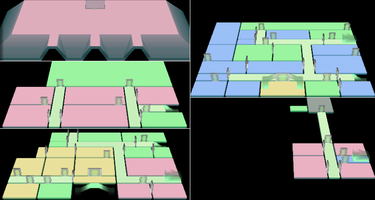 The Guest Room can be found in Area Four of Luigi's Mansion. When Luigi first enters the Guest Room the entire room is upside down. After he fights and captures Sue Pea, he exits the room and hears rumbling. 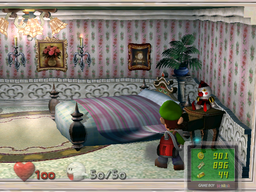 When Luigi re-enters the room, it is the right way up and he can claim the treasure chest that was on the 'ceiling'. The Guest Room contains quite a few objects of note. First, there is a vanity on the west wall that serves as a warp to the Foyer. The bed takes up much of the eastern half of the room, and there is a nightstand beside it. Behind the bed is a plant that can be watered for a Blue Jewel. It has a picture of a cat, along with a picture of two puppies. This page was last edited on August 30, 2018, at 16:35.